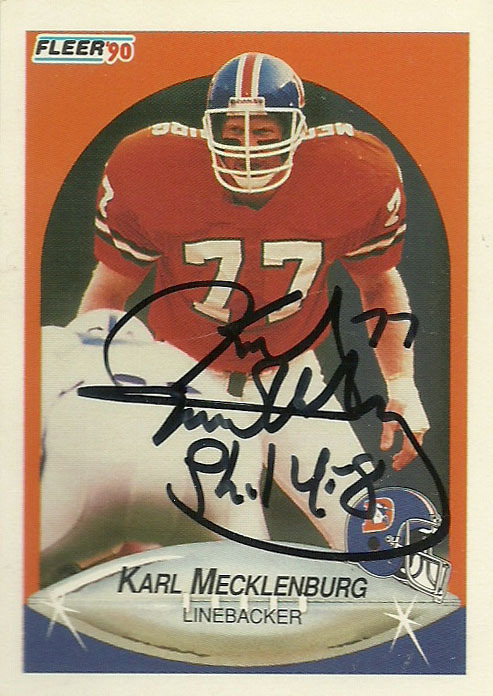 Nobody paid much attention when with the 310th pick of the infamous 1983 draft, the Denver Broncos took a flyer on a little known linebacker named Karl Mecklenburg out of the University of Minnesota. 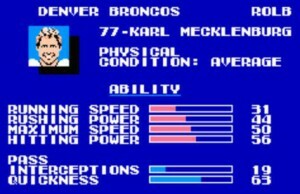 Mecklenburg would just go on to play for 12 seasons, leading them on defense during the Bronco’s Superbowl runs during the 1980s. 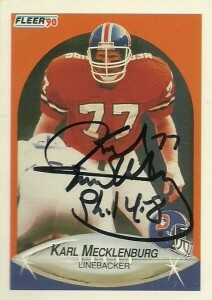 Nickamed the ‘Albino Rhino’ by teammates, Mecklenburg finished his career with 79 sacks and over 1100 tackles. 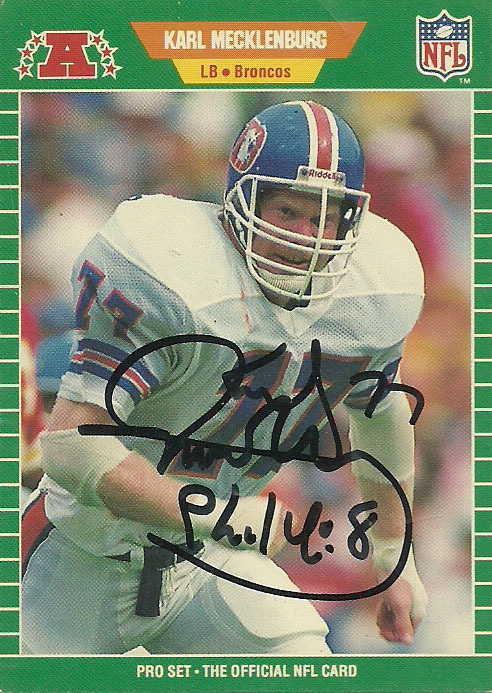 Since football, Mecklenburg has established the REACH foundation, written a book about his experiences as a player (“Heart of a Student Athlete”) and been inducted into the Denver Broncos Ring of Honor. He also does extensive public speaking and resides in Littleton, Colorado with his wife and three children. I sent off for Karl’s autograph, and got a fairly quick response from him with a note about his book in a little under a month. 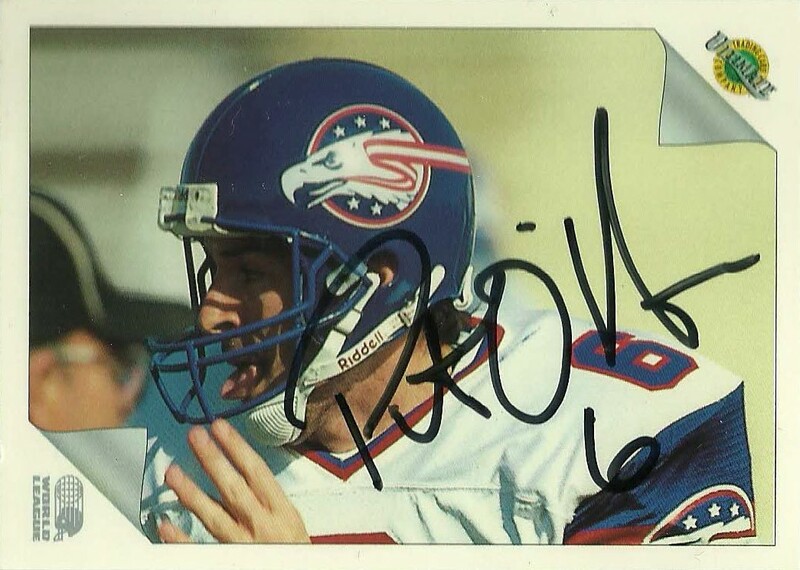 Pat O’Hara was allocated to the Ohio Glory (from Tampa Bay) to back up starting quarterback Babe Laufenberg for the 1992 season but it turned into a full blown quarterback controversy between Laufenberg, Glen Frey, and Pat O’Hara for the starting job. After the season was over he was picked up by the Chargers and thenRedskins, before moving into a starting capacity in the AFL playing for the Orlando Predators from 1995-2000. From 2001-02 he played for the Toronto Phantoms, and then finally the Tampa Bay Storm from 2003-2006 before retiring. It was during his Arena career he built his playing resume winning 3 Arena Bowls in 5 tries. The onetime backup to Rodney Peete and Todd Marinovich at USC, spent time at a variety of head coaching and coordinator jobs in the Arena league before being promoted to head coach of the Orlando Predators in 2010. Oddly enough Pat has also spent some time consulting for movies and actors to assist in authenticity of football films. I received his autographs courtesy of the Predators in about a month. Acquired: In person, Dallas Cowboys training camp 1990. I got Derrick on day two or three at my first Cowboys training camp. He was more than happy to stop and sign any cards that fans had and was genuinely a nice guy even though the players were engaged in blisteringly hot two a days. Derrick was basically trying to live the dream and find a home in the NFL after not being drafted into the league. He was signed as a free agent by the Redskins, and made an impression as a backup kick returner/ punt returner winning a Superbowl in 1987. 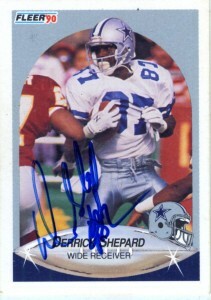 A speedster, Shepard was signed via free agency by the Saints in 1989 and played 4 games before hitting waivers again, where the Cowboys signed him immediately to fill a utility role. Derrick got valuable playing experience at WR and in special teams, starting 8 games, making 18 catches, and scoring the only receiving touchdown of his career. In both 1989 and 1990 he’d lead the team in punt returns, but his role would be shifted to back up in 1991. Transitioning out of his life as a player, Shepard began a coaching career at the high school level and then later returned to the University of Oklahoma, (his alma mater) before becoming the wide receivers coach at Wyoming in early in 1999. A few weeks later while playing racquetball Derrick suffered a fatal heart attack and died. He was only 35. Derrick Shepard is survived by his wife and three children.